Lost in all the newsletter praise is this: Mazzei’s and McDaniel’s “commitment” will ultimately reduce retirement benefits for teachers. House Bill 2132, for example, requires that the legislature find a funding source for any cost of living increase (COLA) in benefits, which means such increases will rarely happen. Senate Bill 377 raises the retirement age for new OTRS members and opens the door for more age increases down the road. The work in Oklahoma continues. A House oversight committee on pensions will hear four interim studies on the issue, which is a welcome change from the many years of looking the other way while our state’s unfunded liabilities mushroomed. Undoubtedly, The Oklahoman editorial page, under the leadership of J.E. McReynolds, will support any and all efforts to strip teachers and other state workers of even more retirement benefits. 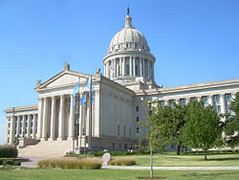 McReynolds, along with CapitolBeatOK’s editor Patrick B. McGuigan, the former ultra-conservative editorial page leader of The Oklahoman, and the Oklahoma Council of Public Affairs (OCPA), a conservative think tank, have apparently made so-called “pension reform” a major issue. What this means is that they are providing cover for Republican politicians to take benefits away from teachers and other state workers. In some ways the efforts here mirror the current Republican debt-ceiling argument in Washington, D.C. That argument is that government should be cut at whatever the cost to our quality of life and wealthy people should get tax cuts. It’s also worth noting that The Advisor also published an article announcing the appointment of two new board members with conservative political backgrounds to the OTRS board. They are Jonathan Small, the OCPA’s fiscal policy director, and Jill Geiger, budget director of the Office of State Finance. Small’s appointment speaks for itself. He will represent Schools Superintendent Janet Barresi on the board. As you might recall, Barresi, a Republican, tried to get Geiger appointed director of finance at the Department of Education. Geiger will represent Preston Doerflinger, the director of the Office of State Finance and an appointee of Gov. Mary Fallin.